I've been lugging the Sony Vaio TR3 notebook for the past 4 years. It has served me well and I have nothing much to complaint except that the webcam failed after 1 year. I don't use it anyway so I didn't bother to get it fixed. 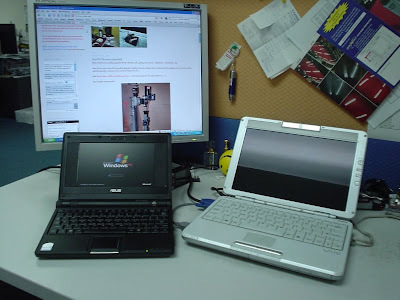 My friend 9W2AFY brought the subject of Asus Eee PC for special uses... After doing some study and looked at the unit, I fell in love and bought it last weekend. It was loaded with Xantros Linux and have about 40 applications built-in. Since I have been a Windows user for along time, my familiarity and gadgets are all windows-based. I reinstalled the system with Windows XP Professional the same night... It worked with no problems and surprisingly fast for a Celeron 600MHz system. Spend the last few days installing other applications including Microsoft Office, MapKing, some utilities and some of my must have applications for my hobby (MikroC, PicKit2, etc). My first thought is that the 4G SDD (Silicon Disk Drive) is kinda small but when you consider the applications you intend to load on it, I still have more than 1G of free space... The small screen limits the type of application you can run (screen is 7", 800 x 480 display). Eee PC News, Mods and Hacks.